Dagwoods gift cards make great gifts! Whether it’s for friends, family, co-workers or yourself, our gift cards are always useful! 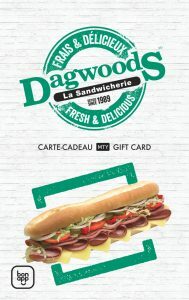 Paying with a gift card is a quick, safe and easy method, and it can be done at any participating Dagwoods location in Quebec and Ontario.